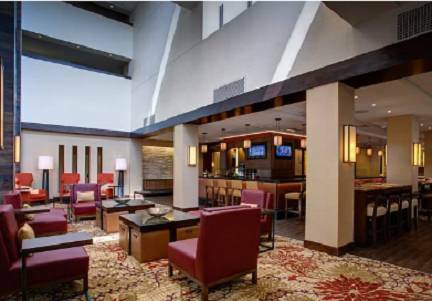 Experience the extraordinary when you stay at the stylish and modern Houston Marriott North. With amazing views of the Bayou City skyline and a prime location, our hotel is close to George Bush Intercontinental Airport, Sam Houston State University and other popular attractions. Rest up from your travels in our spacious rooms and suites with soft beds covered in luxurious linens. In the morning, relax in bed a little longer while waiting for room service, or venture downstairs to DEN, our on-site restaurant. After fueling up for the day, use our high-speed Wi-Fi in your room or from the lobby to find the best areas to visit during your stay. If you want to squeeze in a workout while at our hotel, we have a large fitness center that offers plenty of free weights and cardio equipment. Our hotel also boasts an indoor/outdoor pool with plenty of lounge chairs and towels, so you can enjoy a few extra moments of relaxation while soaking up the sun. Live your best life while at Houston Marriott North. DEN. Drink Eat Network: Please your palate in between your Houston adventures at our restaurant. Take your pick of shareable starters, fresh salads, indulgent steaks, seafood and burgers. We also serve Starbucks coffee and offer an extensive wine list in an inviting ambiance.